We invite you to take a look at a practical situation. This video reference shows you our crate washing system, which can be viewed within a virtual 360 degree environment. The route the crates take is therefore easy to follow. The more it appeals to your imagination, the more clearly your specific situation comes to the fore. Fleischhof Rasting is a well-known meat processing company based in Germany. As a permanent partner of EDEKA, Westfleisch and Tönnies, they have a significant market in Germany. However, this creates constant challenges when it comes to hygiene. Rasting uses two Elpress crate washers, each for a unique load carrier. The two types of crates differ not only in their shape and size, but also in the type of contamination: meat contamination and fish contamination. For both types of contamination, a specific setting and approach is required with, for example, a difference in the cleaning temperature. This final arrangement was reached on the basis of our advice. 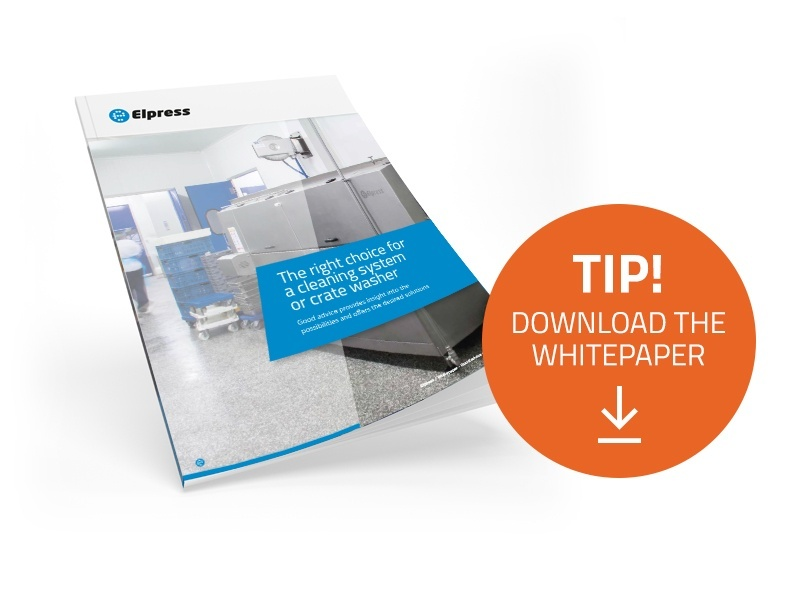 You may have already read the white paper: ‘The right choice for a cleaning system or crate washer’. In it, we deal with important points in the area of advice. Taking advice from an established partner is very important for finding a suitable solution. For example, have you ever thought about what the type of pollution can mean for the cleaning process? Or might you need excess capacity to cope with future growth? For Elpress, these are questions that we think about together, and have been doing so for over 40 years! Not read the white paper yet? Have you not read the white paper that can help you on your way to making the right choice yet? Then download the white paper ‘The right choice for a cleaning system or crate washer’. Buying a crate washer: what is the best choice?